oday, there are many kinds of incense sticks, high-grade to low-grade incense sticks, and incense sticks to toxic incense sticks. This has led many confused customers to choose the right product for their health and devotion to the deceased. - Non-chemical incense incense brown or natural color of incense wood incense, chemical incense usually yellow, black. - Non-chemical incense with natural aroma, thoang gentle, relaxing. Incense chemicals are often strong, shocking, unpleasant. 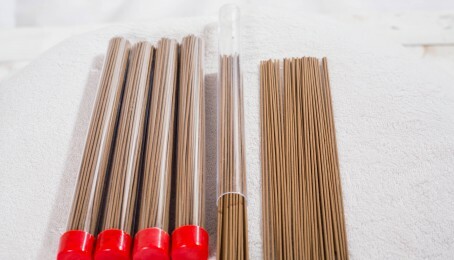 - Clean non-chemical incense with round toothpick, sure high. Chemical incense is made a kind of incense powder, along with incense sticks, colorants and chemicals (odorants). Regular incense powder made sawdust, pulp, sugar cane, rice husk powder ... pureed. Note: When you hold the incense stick on the nose to breathe deeply and strong, if the smell is pleasant, gentle and not choking, it is non-chemical incense. If you inhale strongly that is hot, choke is that chemical incense. Agarwood OUDVIETNAMSTORE produces 100% natural Agarwood, absolutely free chemicals. Incense is specially used as a very meaningful gift and spiritual element.